Israel, in the throes of an existential war on terror, saw no reason to deny Ahlam Tamimi - the person who planned the Jerusalem terror massacre that killed Malki Roth - the privilege to ascend a cinematic soapbox, spew her venom and get her smiling, glamorous promotional picture in the international papers. She and dozens of other Palestinian terrorists were allowed to star in a documentary film that has sold out theaters. Reading reviews of the Israeli documentary "Hot House" has been a traumatic experience for me. Is this normal? I doubt if even psychologists could say. No compassionate state would subject a mother to such torture. No sane government would help a cold-blooded mass murderer ascend a cinematic soapbox, spew her venom and get her smiling, glamorous promotional picture in the international papers. But Israel, in the throes of an existential war on terror, saw no reason to deny Ahlam Tamimi - the person who planned the Jerusalem terror massacre that killed my daughter - that privilege. She and dozens of other Palestinian terrorists were allowed to star in a documentary film that has sold out theaters. Shimon Dotan, the Romanian-born former Israeli who made "Hot House," says the Prisons Service freely admitted him to half a dozen prisons across Israel over the course of a year. The authorities deserve a "certificate of honor," he says, for their permissiveness, adding: "It is difficult for me to say that, and I don't want to brag about it." His film exposes astonishing aspects of life behind bars in Israel where convicted Palestinian terrorists enjoy country-club-like conditions. They all have access to Israeli and Palestinian radio, television and newspapers. Cells, shared with terror-group cronies, are equipped with their choice of colorful rugs and wall hangings. Cooking facilities allow them to indulge their personal culinary tastes. They enjoy bi-weekly family visits. They are free to hone their political skills, conduct internal elections and nurture their political careers. Prison garb is waived; women sport Islamic attire, down to the colorful silk scarves my daughter's murderer favors. Prayer halls are available for the free practice of the very faith that inspired their crimes. And as the film points out, many of them earn, at the Israeli citizen's expense, university degrees. 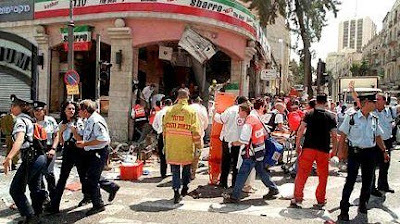 In Israel, the death penalty is never applied to terrorists. No one in the Prisons Service challenges this absurd state of affairs. "Hot House" could have been used to counter the rampant disinformation about Israel's treatment of Palestinian prisoners. Yet nothing was farther from the producers' minds. Dotan, who has resided in the U.S. and Canada for several years, missed one of Israel's most harrowing periods. Yet he says his motive is to "make Israelis understand the issue of Palestinian prisoners [and] think we are doing exactly the same things [to the Palestinians] in their civilian life. We owe them empathy." Dotan is not alone in his conviction that to defend yourself against murderers is no different than murder. Many Israelis espouse and express this perverted morality. In Israel, as in any authentic democracy, everyone may freely voice his views. Yet "Hot House" goes beyond free speech. It was primarily underwritten by Israeli government sources - not Dotan's personal funds. In other words, by us taxpayers. The New Foundation for Film and Television was established in 1993 to essentially support the production of documentary films. With 60 percent of its budget, millions of shekels annually, coming from the Education, Culture and Sports Ministry, this foundation was a primary source of the film's budget. Compared to the release of 256 Palestinian prisoners and amnesty granted to 180 wanted terrorists, both of which Israel recently did, funding a pro-terrorist film may seem like child's play. But films are skillful victors over naive hearts and minds. Israel's leaders have been notoriously lax in their attitude toward public relations. "Hot House" reveals that they have actually been pro-actively blackening their country's image. Consider one of the human beings they have chosen to profile: my daughter's murderer. Dotan says he sat with her for two hours, having a "gripping" conversation. He asked whether she knew how many children had perished in the bombing of Sbarro. Smiling, as she generally does, she guessed "three." "It was eight," Dotan corrected her. She seemed delighted and smiled again, asking, "really?" You will be bringing this evil creature, Tamimi, untold pleasure. Dotan says she was keen to publicize her views. You will pad the bank accounts of individuals who revile Israel. And you may emerge convinced that this film conveys a balanced picture of the entire Israeli-Palestinian conflict. A film without a single appearance by a victim of the terrorists. Not one photograph. Not even one name. * Frimet Roth is a freelance writer in Jerusalem who frequently contributes articles dealing with terrorism, and with special-needs children. She and her husband founded the Malki Foundation (www.kerenmalki.org) in their daughter's memory. It provides concrete support on a strictly non-sectarian basis for families in Israel who care at home for a special-needs child.